NitroBrew is designed to infuse nitrogen into any drink. That said, it is indeed a system originally designed for beer. It lets you take your favorite beer from a can, a bottle or a growler and pour it as a classic nitro style beer in less than a minute. Typical consumer uses 12 oz of commercial, carbonated beer with the NitroBrew system. NitroBrew of course infuses a substantial amount of nitrogen (in fact, a LOT more than your typical nitro style beer dispensed in a tap system). Moreover, NitroBrew also reduces carbonation to that perfect 1.25 – 1.4 volumes to give you the classic nitro pour and the smooth, creamy goodness. With NitroBrew system, infuse nitrogen, carbonate or whatever! Many NitroBrew customers are also passionate home brewers. For these creative souls, here are a few ideas to get out even more from the NitroBrew system. Home brewed beer, may come carbonated perfectly like a commercial beer, or may be not. May be the beer is taken straight out of fermentation and never carbonated to begin with. 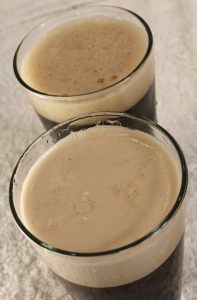 Either way, you can pour a nitro style beer from whatever you have. 1. 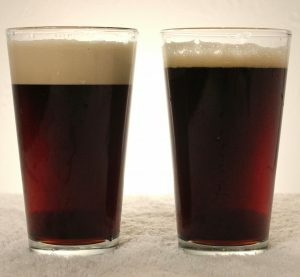 Make a nitro version of your homebrew in a minute, right after fermentation and/aging. No need to carbonate the beer first. Fill your kettle with about 12 oz of your chilled homebrew. If the beer is still warm, let sit on ice for a minute while you arrange the charging system. 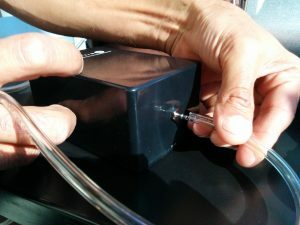 Connect beer gas (~70% nitrogen, ~30% CO2- you can also use somewhat different gas composition as well with adjustments on total pressure) to the charger. Adjust gas supply pressure to about 35-45 psi pressure. Now charge the kettle like you normally would, shake and pour through the dispense valve for that classic nitro beer. You can use more beer than 12 oz, if you can make adjustments on supply pressure. Experiment to figure out what suits your taste. 2. Don’t have beer gas mixture? No problem. After you poured your homebrew and chilled it in the kettle, add a shot of 100% CO2 first (use a gas supply pressure of about 12-25 psi) and shake the kettle. 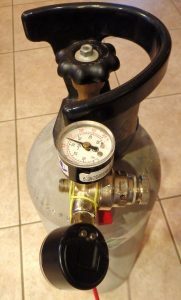 Then NitroBrew with 100% , nitrogen (or even compressed air) at a pressure setting of 45 psi. usual pressures). Serve like you normally dispense from the NitroBrew system. 3. NitroBrew as a simple, on-demand carbonation system. You made that nice beer, and you can’t wait another week or more to fully carbonate by “bottle conditioning” with yeast and added sugar. NitroBrew can double as a simple carbonation system, and get your your beer to drink in just a few minutes. You can take your beer right out of fermentation (and aging, as well, you purists out there!). Depending on the fermentation temperature, it is likely that your beer is carbonated at about 1 volume. Pour 12 oz of beer- into your kettle and close the lid. Since NitroBrew system is all stainless-steel, you can quickly chill your beer by placing the kettle on ice. 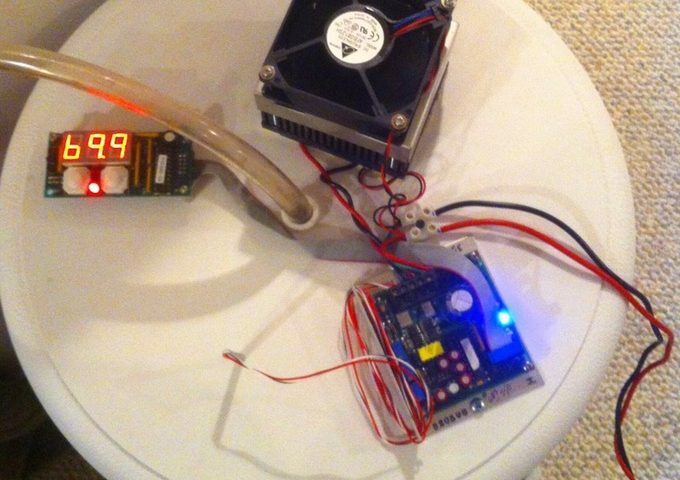 Connect the charger to a CO2 supply. Set the CO2 regulator to between 25-35 psi and NitroBrew like you normally would. Shake the kettle and let sit for a few minutes upright on ice. By the way, NitroBrew recommends shaking the kettle by holding the kettle itself, not by the kettle-handle. 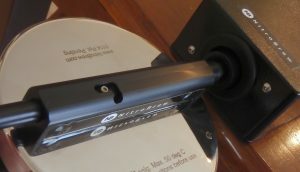 With the kettle still being upright, slowly vent the kettle pressure by gently pushing on the valve push button. When the pressure is safely vented, the pressure safety lock will disengage and you will be able to open the lid. Just pour out your beer into a serving glass directly from the open kettle. As an aside, you can fill more than 12 oz of beer- even 16 oz, but you may need to use higher pressure for charging. Experiment and see what works. Note however that we recommend that you do not exceed about 45 psi gas pressure. While we are on the subject of beer carbonation, did we mention that you can use the same process to carbonate numerous other drinks, like sodas, juices, etc ? NitroBrew is all about unleashing your creative side! Feel free to experiment! Share your experience!